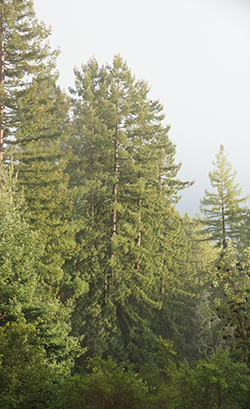 Building locally and sustainably requires an intimate understanding of the redwood forest we live in. Standing forests are globally the single largest resource of renewable carbon, and tended properly can produce superior products for many generations. The concept of increasing productivity, while harvesting trees, starts with integrated forest management which integrates the finished building design into the long-term harvest plan. We do this by not cutting a single tree until we have crafted working scale models which take the clients’ ideas and integrate them structurally for the least amount of wasted space, introducing sunlight and open timber frame ideas while conserving precious materials. In this way, each finished design becomes a reflection of the forest. The same tree can provide siding, ceiling boards, posts, beams, and stud-framing materials. Santa Cruz Timberframes prides itself in designs which utilize more of each standing tree (up to 80% on average)*. By using structural timbers to carry the weight of the building we save space and distribute loads more efficiently. Our finished homes have a rich woody interior space. Built with redwood, the whole house reflects the highest grade materials available. 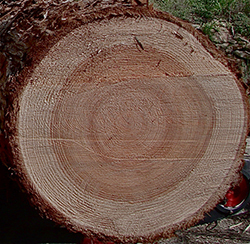 We use trees evenly aged at 140 years**, so tight grain patterns provide more than 50% of the total milled material with a grade of Select Structural #1, the highest grade available in US Grading Standards. In order to maintain strict sustainable forestry practices going forward, we only accept individual projects which meet all our stringent requirements. We tell folks “if you’re looking for something quick, we’re probably not your choice”. Our design-build team consists of all professionals needed to build using strictest codes and fully fleshed-out plans - down to every last detail. 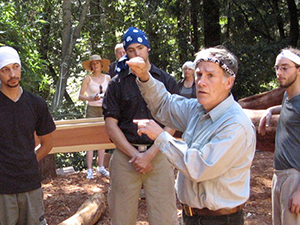 In order to make this vision a reality, the importance of maintaining an active training program for local carpenters, with an emphasis on forest restoration, led in 2001 to the establishment of a forestry apprenticeship program in Bonny Doon, California. Traditional hand-craftsmanship skills are taught using hand chisels and planes for mortise and tenon joinery. Different traditional textures are used, as with adzes to create hand-hewn post and beam timbers. Careful attention to the forest season allows us to harvest trees during the short bark-peeling season, when the finished beams can be polished smooth and left completely natural in the round. As other trees age and die naturally they are harvested, and most of their branches are chipped into mulch to be re-distributed on the forest floor. Low impact trails are maintained by using skid-sleds to transport beams out of the forest, eliminating the use of tractors and heavy equipment. Outreach to the community takes the form of hosting local elementary school field trips each year, and lectures and workshops on sustainability and timber frame joinery.